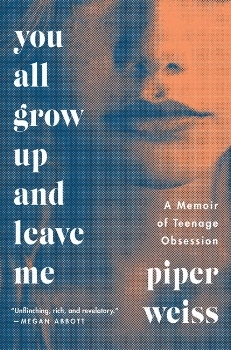 Join us as we welcome Piper Weiss, author of the recently published memoir/true crime book You All Grow Up and Leave Me, for a discussion about her work with local crime reporter Philip Eil. A riveting blend of true crime and coming-of-age memoir—The Stranger Beside Me meets Prep—that presents an intimate and thought-provoking portrait of girlhood within Manhattan’s exclusive private-school scene in the early 1990s, and a thoughtful meditation on adolescent obsession and the vulnerability of youth. Piper Weiss has served as editor in chief at Levo, editorial director for HelloGiggles, and features editor for the New York Daily News and Yahoo. She is the author of the book My Mom, Style Icon and has written for various publications, including Hazlitt, McSweeney’s Internet Tendency, Elle.com, and Refinery29. She lives in Brooklyn, New York. Philip Eil is a freelance journalist based in his hometown: Providence, Rhode Island. He was the news editor and staff writer at the alt-weekly, the Providence Phoenix, until the paper closed in 2014. Since then, he's contributed to VICE, the Atlantic, Salon, the Jewish Daily Forward, and Rhode Island Monthly, among other outlets. He teaches part-time in the Literary Arts + Studies department at the Rhode Island School of Design (RISD).